The elixir of youth – the magic potion we're constantly seeking to maintain our looks and youth. The hundreds of tried and tested skincare products we've all forgotten about in the bathroom cabinet as we reach for the next quick fix. Well, next time reach to the kitchen cupboard for a healthy serving of eggs. We're not strangers to advice telling us to limit sun exposure, alcohol and smoking to prevent early ageing but one of the biggest contributors to the maintenance of strong bones and youthful-looking skin is underrated – diet. The right diet, with sufficient amounts of vitamins D and E, omega-3 fats and protein, is a key component to slowing visible ageing, cell damage and bone fragility. 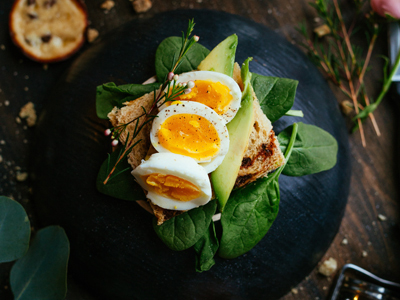 With a single serve of eggs contributing to a high proportion of your recommended daily intake of vitamin D, they make a significant contribution to promoting bone health and muscle function. So, eat a serving of egg a day and your body will reap the benefits both inside and out. Full of protein and antioxidants from selenium and Vitamins A and E, eggs are a versatile and cost-effective food to add to your diet to boost your skin's health as well as helping protect it from damage and ageing. While skincare products play their role in maintaining hydrated, soft skin they work the hardest in combination with a healthy, active lifestyle. Your body, like your skin, looks and feels best when fed and exercised well and with eggs providing 11 different vitamins and nutrients they help keep you at your best. If the saying 'you're as young as you feel' is true, then eating eggs full of quality protein and vitamin D is one way to stay youthful and maintain healthy bones and cells. The antioxidants in eggs help protect cells and tissues from damage so they can continue functioning healthily and your body retains the robustness of its youth. Leading dietitian Sharon Natoli from Food & Nutrition Australia commented: "We can't put a stop on our body clocks but we can certainly help them to work their best. One of the tricks to looking and feeling youthful is a well-balanced diet which will help nourish the skin from the inside out. People are often looking for a quick fix and instant results however the real secret is that maintaining a well-balanced diet will reap its benefits over the years." Question: Why are eggs the elixir of youth? Sharon Natoli: Eggs contain a broad range of nutrients that are essential for healthy skin and for helping to protect skin cells from damage that arises as a normal part of the aging process. These include the antioxidants vitamin E and selenium, along with lutein and zeaxathin, two pigments found in eggs which have antioxidant functions. Eggs also contain omega-3 fats which are incorporated into cell membranes and help them to perform at their best, while the protein in eggs provides the building blocks for healthy skin cells. Question: Can you share your best tips for keeping our skin youthful? Question: Why is it best to nourish our skin from the inside out? Sharon Natoli: People are often looking for a quick fix and instant results however for skin to be healthy day in and day out; it needs to be fed correctly. This means eating a well-balanced diet over the long term and adopting healthy habits you can maintain. Question: What vitamins and nutrients do eggs contain and how does this keep our skin youthful? Sharon Natoli: Eggs contain at least 11 different vitamins and minerals, along with the antioxidants lutein and zeaxanthin, omega-3 fats and protein. Many of these have a role in keeping our skin youthful (see above). In addition to the antioxidants in eggs, and their omega-3 and protein content, eggs are very high in Vitamin D, providing around 80% of our daily needs in one serving (2x60g eggs). Vitamin D helps the body absorb calcium which is needed for bone strength, including keeping the bones in our face strong, therefore reducing the tendency of the skin to sag over weakening bones as we age. Question: How does eating plenty of fruits and vegetables keep our body strong and healthy? Sharon Natoli: Fruit and vegetables are packed with nutrients and most are high in fibre, while also being low in kilojoules, which is great for weight management. For people looking to meet all of their nutritional requirements from their foods, eating around two pieces of fruit and five servings of veg in a day will make a significant difference to achieving this goal (one serve of veg is ½ cup cooked or 1 cup of salad veg). Question: How can we incorporate eggs into our daily routine? Sharon Natoli: Eggs can be included at any meal of the day or as a snack. Scrambled, poached, boiled or fried in a healthy oil like olive oil. Adding eggs to salads at lunch is quick and easy, or cracking an egg into a veggie based soup to bump up the protein and nutrient content. 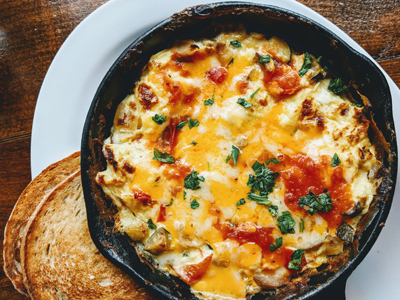 It's good to also think about eggs for dinner – like omelette's or frittatas – or adding them to a stir fry for extra nutritional value. They are also excellent as a snack – boil a few eggs on the weekend and keep them in the fridge to take with you to work or if you are going out and about. Nature's own protein ball! Question: How many eggs should we be eating a week? Sharon Natoli: Eggs are okay to be eaten every day. 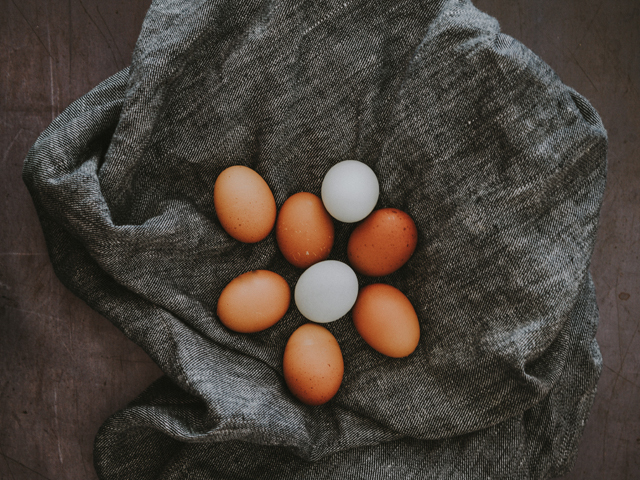 Consider eggs like other protein rich foods (lean meat, chicken, fish, legumes, nuts, seeds, tofu) and incorporate them into your diet as part of a variety of foods from this food group over the week. Question: Can you share your favourite ways to eat eggs? Sharon Natoli: My favourite way to eat eggs is scrambled with a side of mushrooms and avocado and a slice of wholegrain toast. Sharon Natoli: Healthy skin, like all aspects of our health, is achieved by having a balanced lifestyle. I am very conscious of my morning routine and aim to start each day having accomplished something before breakfast. Every second morning I get up and go to the gym then come home and eat. On the alternate day I get up with an hour to spare before breakfast. In this hour I include a 10-15 minute meditation, 10 minutes of journal writing and half an hour working on something creative. I then eat breakfast. The gym mornings I always eat eggs on toast and a piece of fruit and on the other mornings it varies. I might have wholegrain toast with cheese or avocado and a piece of fruit or fruit with yoghurt or sometimes a brown rice bowl with seaweed, sesame oil, chili, sunflower seeds, spinach (from our back garden) and a poached egg on top – yum! This is of course complemented by cleansing and moisturising my skin twice a day.